In 2015, Human Rights Watch (HRW) issued a 111-page report asserting that the Lower Brule Tribal Government in central South Dakota mismanaged “tens of millions of dollars” since 2007. The U.S. Department of the Interior’s inspector general (OIG) investigated the use of federal funds intended for a rural water project on the tribal reservation and found that almost $1.5 million was missing. In a settlement announced by the Interior Department’s Bureau of Reclamation (responsible for “managing water in the west,” according to its website), the tribe will only have to pay back $54,190 of the more than $1.4 million to the federal government. The funds were part of the Mni Wiconi (Lakota for “Water is Life”) Rural Water Project. As the Argus Leader reported, “The OIG audit found a host of problems, including tribal council members paying themselves extra money, including for meetings they didn’t attend, and others receiving tens of thousands of dollars in ‘additional compensation’ that was not documented to show what they did to earn the money.” The audit also faulted the Bureau of Reclamation for not exercising proper oversight in the expenditure of federal funds by the tribal government. The Lower Brule Sioux Tribe’s (Kul Wicasa Oyate) reservation is home to about 1,300 residents living on 200 square miles along the Missouri River. Economically speaking, using December 2016 figures, unemployment is low at only 4.9 percent, but median household annual income is just under $33,000, about 40 percent less than the national figure. 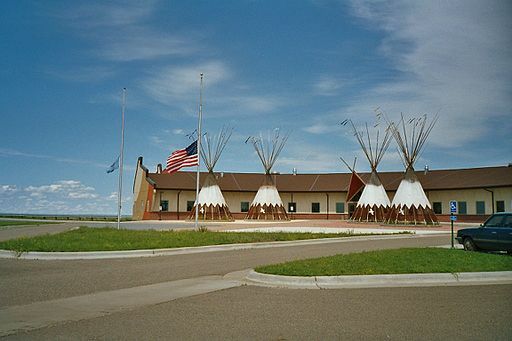 Major employers are the Lower Brule Sioux Tribe, Lower Brule Sioux Tribe Golden Buffalo Casino, the U.S. Bureau of Indian Affairs, and the U.S. Indian Health Service. While the shared responsibility between the tribe and the federal government for the missing money might contribute to the size of the reimbursement by the tribe, the small settlement amount has attracted criticism from Human Rights Watch and two-thirds of South Dakota’s congressional delegation. “Since more than $100k of the misused money went to unauthorized bonuses, compensation, and entertainment, the bureau and tribe need to explain why they only have to repay about $54,000 of the $1.4 million the OIG said was misspent,” said Arvind Ganesan, the director of the business and human rights division of Human Rights Watch (and the author of HRW’s 2015 report).